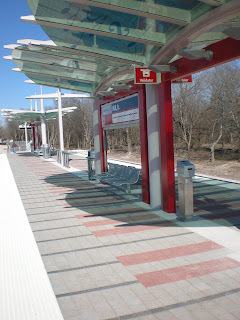 Capital Metro continues the MetroRail Station Open Houses today. Today you have your choice of two stations: MLK, Jr. and Crestview, both from 10 a.m. to 2 p.m. Yesterday the group of Capital Metro staff who are volunteering at the open houses took a bus to MLK, Jr. Station to be trained on the use of the ticket vending machine and to tour the station. I snapped a few photos–it’s beautiful! This station has a musical theme, with musical notes portrayed in the metal guardrails and on the glass canopy shelter above. The station paving stones are made to look like piano keys. 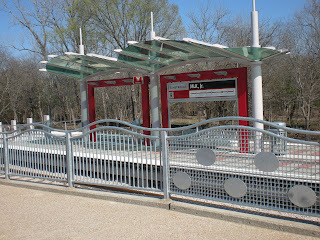 The MLK, Jr. Station is one of two stations that will have rail connector bus routes direct to major centers of employment. There will be two connectors from MLK, one to UT and another serving the Capitol Complex.